Happy Cinco de Mayo! This week, we’re celebrating with crunchy taquitos flavored with Garlic Gold® Southwest Nuggets. We mix them up with shredded chicken and tender black beans to make a flavorful filling, then roll it up into warm corn tortillas. Brushed with Garlic Gold® Oil and baked, they become crispy and delicious (and much healthier than the fried kind, too). Before you make the taquitos, you’ll need to have some cooked chicken breasts on hand. You can pan-fry, poach, or bake them — whatever your favorite method is will work just fine! Just season them lightly with salt and pepper, and cook them until they’re 165ºF in the middle, then shred them up for the taquito filling. Make the taquito filling: In a large mixing bowl bowl, shred the cooked chicken with a knife and fork. 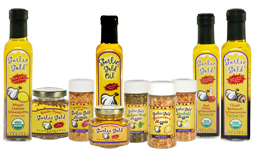 Add the beans and Garlic Gold® Oil, using a wooden spoon to mash the beans on the side of the bowl. Add the cheese, Southwest Nuggets, and cilantro, and stir to combine everything evenly. Warm the tortillas in the microwave: Place two tortillas between two damp paper towels, then microwave for 30 seconds. They should be warm and easy to bend — microwave for 10 more seconds if they are still stiff. You’ll repeat this process with the remaining tortillas as you fill and roll them. Roll the taquitos: Scoop 1/4 cup of filling onto each tortilla, arranging it in a line across the bottom third of the tortilla. Roll the taquitos tightly, then place them seam side down onto the baking sheet. Warm up two more tortillas, fill and roll them, and repeat until you have rolled all of the taquitos. 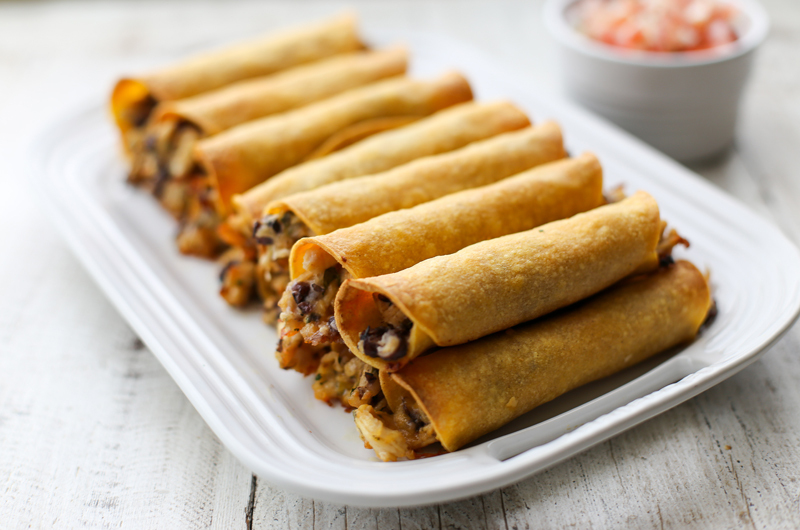 Bake the taquitos: Brush the taquitos with a light coating of Garlic Gold® Oil. Bake for 25 minutes, until crispy and beginning to brown. Serve them piping hot, with salsa on the side for dipping.